A new instrument has been developed for utilization in attempts at myopia therapy and control. The inventor discusses instrument design and treatment procedures, and suggests an explanation for the movement of juvenile eyes from hyperopia into myopia. The word emmetropization has been used to designate the apparent coordinated or correlated growth of the various structures of the eye. For example, axial elongation during growth would be compensated for by a flattening of both lens and cornea. Myopia, according to this view, develops from failure of compensation.1 I suggest, on the other hand, a concept of myopia development in which the movement of youthful eyes from mild hyperopia, through emmetropia, and into myopia is seen not as a failure of compensation, but as the normal compensation of the normal eye to excessive close work. According to Sorsby,1 the components of the eye attain near-adult size during the rapid growth of the first three years of life - the infantile stage - after which the eye is left somewhat hyperopic. This is followed by much slower growth from the age of three to 13 - the juvenile or definitive stage. I suggest that it is during this stage that the cushion of hyperopia is used by the eye for the final refinements in the vision. Recent research by Young2 suggests that there is a pressure increase in the vitreous chamber under accommodation and convergence, and that this increase in pressure is directly related to the amount of accommodation exerted - the greater the amount of accommodation and convergence, the greater the pressure. It is believed that if this increase in pressure is present over an extended period of time due to a lack of relaxation of the ciliary muscle, an overall enlargement of the vitreous chamber will result as the coats of the eye are stretched and, over a period of time, aqueous fluid moves into the vitreous chamber to fill the increased volume. In tests on monkeys, it was found that a ciliary spasm, once it developed, was usually followed in two to four months by an increase in axial length, thus creating a true axial length myopia.3 Young feels that it is difficult to explain this pressure increase using the Helmholz theory of accommodation, where the ciliary muscle relaxes the tension of the zonule and allows the lens to become more convex. A more compatible explanation is that of Tschering, who claimed that the ciliary muscle, in pulling on the choroid, pressed the vitreous, the ciliary body and the posterior part of the zonule against the lens, which it thus forcibly altered in shape.4 According to Coleman,5 neither of these two theories of accommodation fully explains how the eye responds during accommodation. The Helmholtz theory does not allow for an active role of the vitreous body, since to do so would apparently contradict the relaxed zonule feature observed during accommodation. The Tscherning theory, on the other hand, largely ignores the features of the relaxed zonule and capsular elasticity. Coleman's model of the accommodative mechanism explains accommodation as a function of both lens elasticity and vitreous support based on analysis of hydraulic forces in the eye, and shows that active vitreous support is consistent with decreased zonular tension, and that the two theories are not contradictory. On this theoretical basis, it is possible to imagine that a form of ciliary spasm with increased vitreous pressure is meant to occur in the normal hyperopic juvenile eye, since it must accommodate to see clearly even at a distance. The eye thus increases its length because of this pressure until it reaches emmetropia (or near emmetropia), at which time little or no accommodation is needed for distance vision and the full amplitude of accommodation is available for near vision. Many children move through emmetropia into myopia because the constant close work does not permit the ciliary spasm to relax. According to this view, these myopic eyes are reacting normally to their environment. The many children who do much close work but do not move past emmetropia perhaps do not develop a ciliary spasm because they hold the book farther away, or because they look up more often, or for other reasons. The markedly hyperopic eye which does not move toward emmetropia is seen, on the other hand, as an eye which for some reason is not developing properly. 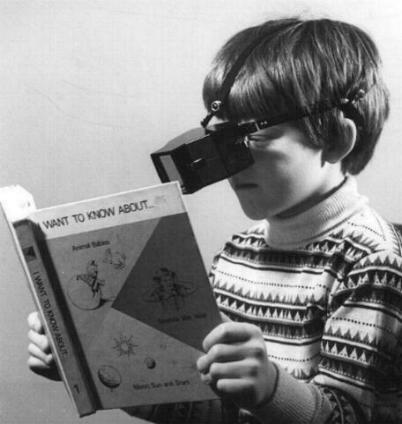 In theory, the development of about 3 D of myopia would enable the uncorrected myope to read without accommodation, and the further progression into myopia would cease. However, if the myopia is corrected with concave lenses, and these lenses are used for reading, the same process could be repeated each time the glasses are strengthened. Based on the above, and the apparent lack of any evidence that stretching of the coats of the eye can be reversed after it has occurred, an attempt should be made to halt the movement into myopia and return the patient to emmetropia before the myopia becomes more or less permanent. Using the Myopter viewer for as much of the close work as possible is one method of attacking the cause of the ciliary spasm. A similar technique could, of course, be used to try to prevent established myopes from progressing further into myopia. The development of the Myopter viewer was based upon the belief that acquired myopia is caused by an excessive amount of close work, resulting in a ciliary muscle spasm (or, in other words, a change in the relaxation level of accommodation), followed by an increase in axial length. The instrument does not merely treat symptoms, but instead attempts to eliminate the cause. Since actually eliminating or greatly reducing close work is difficult in our modern literate society, it seemed logical to place an optical system before the eyes that would simulate distance vision to the greatest extent possible whenever close work was to be done. To my knowledge, no such optical instrument was available for this use. It appeared that accommodation, convergence and stereopsis were the three factors which would have to be closely controlled, since they are normally minimal for distance vision and increase more or less in proportion to each other as the viewed object approaches the eyes. The viewer was designed therefore to reduce these three factors as much as possible. Ordinary eyeglasses obviously have limitations in simulating distance vision, and can do so only partially. For example, if an emmetropic patient were given +3 D lenses for reading at a distance of 1/3 meter, it would eliminate the need to accommodate for this close work and the ciliary muscles would be in a relaxed condition. However, a substantial amount of positive fusional convergence is required since the normal accommodative convergence is decreased. There appeared to be two major drawbacks to this arrangement. Firstly, it is well known that problems can be created in some patients when the normally present accommodative convergence is decreased to this extent. Secondly, since convergence can stimulate accommodation, it seemed illogical to stimulate the ciliary muscles in this manner when the +3 D lenses had been chosen in an effort to eliminate the accommodation. For this approach, everything possible should be working in the direction of ciliary muscle relaxation. The +3 D lenses could be provided with a base-in prism component strong enough to eliminate the convergence at 1/3 meter reading distance, but a significant amount of "pincushion" distortion is present when using such lenses, and the distortion is more noticeable when the object is viewed with both eyes. Even if such prisms were used with the +3 D lenses, each eye would still see a different view of the object and, for this reason, the eyes would be used in an unnatural manner. Therefore, an entirely new approach to the problem was needed. 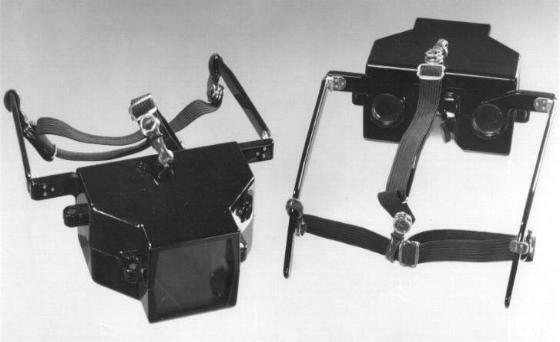 The Myopter viewer is an instrument with a lightweight plastic housing containing lenses and mirrors, and it is worn instead of glasses for close work. Light coming from the viewed object enters the single opening at the front of the viewer and is split by a beam-splitter into two identical parts. A beam-splitter is a mirror with a special coating which only reflects half of the light which strikes its surface. Thus half of the incoming light is reflected 90o at the beam-splitter, and is again reflected 90o by a mirror into the left eye. 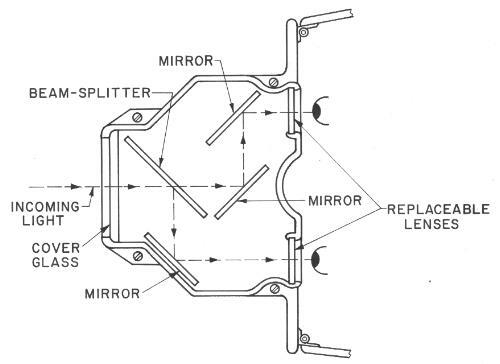 The other half of the light passes through the beam-splitter and is reflected by two other mirrors into the right eye. The two beams emerging from the instrument are parallel, and the axes of the eyes must also be parallel. Convergence is eliminated and each eye therefore sees an identical picture. The accommodation is eliminated by selecting the proper Myopter lenses for the distance usually used for the near point tasks. For the average person, this means selecting lenses which are about 3 D more positive than the distance correction, if one is used. This brings the far point in to 1/3 meter. I saw no detrimental effects in completely eliminating convergence and presenting an identical picture to each eye, since a similar situation exists when a person gazes at a star, or even a distant mountain top. Furthermore, a similar optical system is found in the ordinary non-stereoscopic type of binocular microscope. The replaceable 20 mm diameter lenses fit into slots in the Myopter housing, and the housing can be split in half to change the lenses by removing four bolts. Spherical lenses are available in 0.5 D steps from -3 to +3 D. However, any kind of correction, such as cylindrical or prismatic, can be used by selecting eyeglasses lenses of the proper thickness and grinding them down to 20 mm diameter. There is no magnification or minification designed into the instrument. Depth perception is still possible because of the relative size of the various objects in the field of view, the shadows which they cast, etc. However, the depth perception which we normally get from stereopsis is eliminated. Initially, it may be difficult for a patient using the instrument to relax the muscles of the eyes so that the visual axes are parallel. Although no accommodation or convergence is required, the patient is aware that the viewed object is nearby and force of habit creates a tendency to converge. This diplopia can be overcome easiliy if the object is moved farther away until only a single image is seen. The object should then be brought closer - while the single image is maintained - until it is back at the normal reading distance. To avoid excess complication, weight and cost, the viewer was not designed to be adjustable for various pupillary distances. It was designed with a nominal P.D. of 64 mm and can be used by patients with P.D. 's several millimeters wider or narrower than this, without appreciably restricting the field of view. A wider and a narrower version of the instrument could be designed in the future to cover the full range of patients. The field of view is approximately 20o, which is sufficient to read a book without needing to turn the head. The introduction of an improved version with a much larger field of view is being considered. Clinical tests are now underway on a small scale. I hope that a large scale test can be arranged and the results reported at a future date. 1. Sorsby, Arnold, B. Benjamin, and Michael Sheridan. Refraction and its Components during the Growth of the Eye from the Age of Three. London, H.M. Stationary Office, 1961. Med. Research Council Spec. Report Series No. 301. 2. Young, Francis A., Unpublished Study. 3. Young, Francis A., The Development of Myopia, Contacto, 15(2): 36-42, June 1971. 5. Coleman, D. Jackson, Unified Model for Accommodative Mechanism, Am. J. Ophth., 69(16): 1063-1079, 1970.